Today’s painting is by the Florentine Taddeo Gaddi who was the star pupil of the great Master, Giotto. 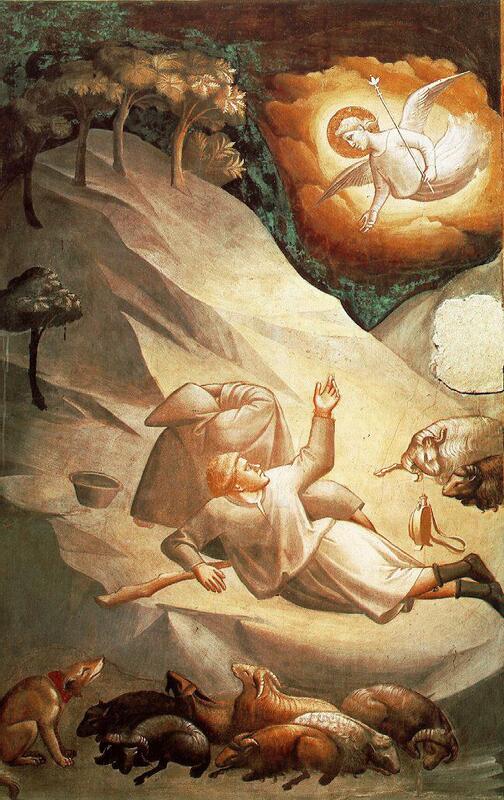 His, ‘The Angelic Announcement to the Shepherds’ can be seen in the Baroncelli Chapel within Santa Croce in his native Florence. It is a wonderfully dramatic painting. An Angel acts as God’s messenger alerting humankind to an event upon which all history will pivot. The Sheep are stirring and the Dog’s keen senses alert him to the messenger from afar. As the Angel speaks eternity merges with linear time. How could the waking Shepherd find the words to tell his sleeping companion what he has learned? It is an invitation which remains open. Our Sleigh is picking up a very special passenger today. He’s here to sing and play on a Christmas song, ‘Zat You, Santa Claus?’ that has the effervescence of a fine champagne. Of course, I’m talking about Louis Armstrong. If they ever get round to carving four heads into a mountain to celebrate musicians in the way that Presidents are celebrated at Mount Rushmore there can be no argument among men and women of reason that the first head to be carved must be that of Louis Armstrong. Zat You, Santa? Zat You, Louis? I could set out an exhaustive list of his astounding achievements as the preeminent musician of the 20th century with special reference to his role as the pioneer genius who transformed a pastime into an art form and who influenced everyone who ever had the good fortune to hear him play. Others far better qualified than I have written major scholarly tomes on the subject. So, I will limit myself to a few remarks on the effect hearing the great man has had on me. When I hear Louis play (at every period of his career) I hear the sound of a master musician revelling in the sheer joy of making music. It was as if he lived and breathed through playing his horn – singing a song of exultation; using without reserve the wondrous gifts of imagination and creative daring yoked to technical brilliance that made him a such a unique musician. Add to that his personal warmth and ebullience and you have a musician and a man who simply made everyone who encountered him feel better, more human and more glad to be alive. Isn’t what Santa Claus is supposed to do too? Next a singer, the late Kay Starr, who knew how to swing and who had the chops to share a bandstand with the finest musicians of her era. Born on a reservation in Oklahoma with an Iroquois father and an Irish/Native American mother she was as American as you can be. Maybe that’s how she could sing the hell out of any song in any genre of American popular music. Kay had an inbuilt sense of rhythm and the ability to musically inhabit and sell a lyric. Listen here to how she brings out the drive and the humour of, ‘Everybody’s Waitin’ For The Man With The Bag’. One of the co-writers of the song was Dudley Brooks who featured earlier in the list featuring Elvis Presley. I can’t honestly say I have done everything I should this year (extra special good) but I can recognise an extra special good singer when I hear one and Kay Starr must be one of the best and merriest we ever did have! Today’s poem is, ‘Advent: A Carol’ by Patric Dickinson a writer who revered and translated the Classical poets while looking at the world himself with a sharply individual measured intelligence. Who then shall hear them? This entry was posted in 1950s, Christmas, Folk Music, Gospel Music, Jazz, Music and tagged Charles Lloyd, Kay Starr, Louis Armstrong, Patric Dickinson, Shenandoah, Taddeo Gaddi, The Angelic Announcement to the Sheperds, Zat You Santa ? by Thom Hickey. Bookmark the permalink. As you see, I’m tagging along at the end of the line, enjoying every minute. I’ll catch up eventually! I love #5. That “Shenandoah” is haunting and meditative (I listened to it three times in a row). Louis really does embody the exuberant joie de vivre of the season, and now I know to go looking for Kay Starr’s recordings. The fine print on the photo caught my eye: Michael Ochs? Michael Ochs? Well, I’ve been a major fan of Phil’s since I was about 19 and I knew of Sonny’s work in keeping Phil’s work alive, so I had to see if Michael . . . Yep, another door just opened. I keep thinking that I’d have to live forever to fully understand what I already know. It’s not gonna happen, but another piece just fell into place. Thank you. Oh yeah, loved Patric Dickinson’s “Advent: A Carol” too. It’s one of those poems that could have been recited centuries ago and passed down the ages to this spare and elegant form. Delighted you got so much out of this post Susanna – that’s what a Cornucopia is supposed to do! Very good point about, ‘all we already know’. All good regards for 2017. Thom. Thanks. Making the choices has been a fascinating exercise. Glad you’re enjoying The Cornucopia.